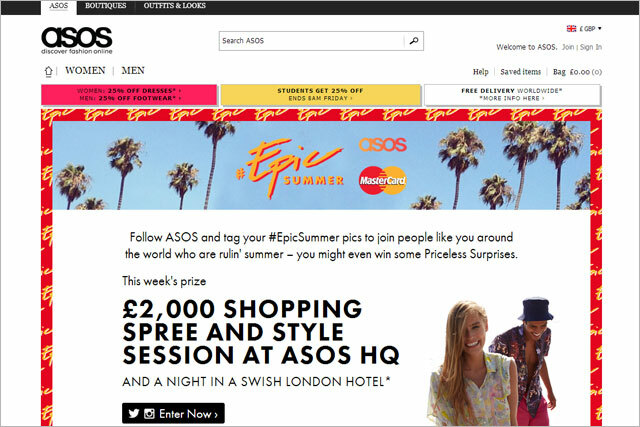 Asos has partnered with MasterCard to celebrate an #EpicSummer, in a social media campaign encouraging consumers to share pictures of their best moments on Instagram and Twitter, with the best being awarded prizes including tickets to concerts. The campaign is running across seven key global markets including the UK. Aimed at 20-somethings, who are encouraged to send in photos of their summer moments, such as at music festivals, weddings and holidays, using the hashtag #EpicSummer. Every week the best uploaded picture will win the entrant an "epic" prize, such as tickets to see Justin Timberlake or Pharrell Williams live. Asos and MasterCard will also run a promotion on their social channels offering #PricelessSurprises to be won at summer events across the globe. Asos said the tie-up marks the first occasion the brand has run a campaign in conjunction with a commercial partner, "delivering a truly native advertising experience to customers". Natasha Billing, Asos’s head of brand marketing, said: "This campaign demonstrates Asos’s commitment to delivering compelling campaigns for partners by bringing together our marketing, editorial and commercial expertise. "Both brands are aligned in offering amazing experiences to young audiences and so the partnership makes total sense for us."